Despite its pedigree, this project has never really gotten rolling, with one big issue being the casting of a co-star. The list of names that have at various points been at some level of attachment include Bradley Cooper, Leonardo DiCaprio, Tom Cruise, Christian Bale, Johnny Depp, Will Smith, Robert Downey Jr., and Jon Hamm. Maybe Beyoncé just saw a slogging production and decided it was time to bail. Keep it moving, you know? Surprise! Beyoncé does have new music about to drop. No, there’s absolutely no evidence to back up this claim. But wouldn’t it be dope if Beyoncé were dropping out of her movie commitments so she could hit us with a new, covertly recorded album?! A word of warning: This is about as much sense as this post is going to make the rest of the way down. Word is, Esperanza Spalding is a possible replacement for Beyoncé. Who? Why, that nice jazz artist that beat Justin Beiber for Best New Artist at the 2011 Grammys, and then immediately incurred the wrath of the Bieber Maniacs (they hacked her Wikipedia page! “[Briefly] her bio included phrases like ‘JUSTIN BIEBER DESERVED IT GO DIE IN A HOLE. WHO THE HECK ARE YOU ANYWAY?'”). Could Beyoncé dropping out, and Spalding subbing in, be the workings of some sort of diabolical long con by the Bieber Army to get Spalding back into the spotlight, and once again make her the target of their rage? You might doubt that JB fans would have so much anger accrued in their tiny little bones, but I’ve said it before and I’ll say it again: Never turn your back on a Bieber fan. As MTV points out, “Beyoncé was first attached to the part in January 2011, but production was eventually pushed back when she got pregnant later that year.” Then, of course, she had the kid. And, I don’t know, now everything’s different? Things that seemed like a good idea, like starring in remakes of Hollywood classics, no longer have value? I’ve never given birth myself, but I hear these kinds of things can happen. So, alternate title for Reason No. 4: It’s All Blue Ivy’s Fault. 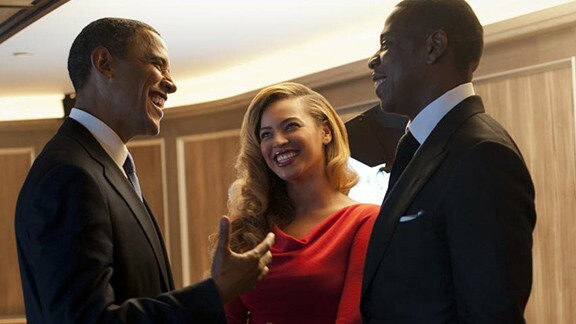 Sure, Barack was cool with Beyoncé doing an Eastwood joint back when The Man With No Name’s status as the rare Hollywood conservative was something we’d remember every once in a while and then immediately forget. And, totally, Barack was cool with it after Eastwood fumbled along at the RNC with his new best pal Empty Chair. And, yep, Barack was cool with it when the 47 percent video leaked and the election looked like it was half in the bag. But then came the bungled first debate, and Romney’s poll bounce, and all of a sudden a vulnerable Barack wants to batten down the hatches, solidify the team around him.